Pendle Hill misses out on the Ordnance Survey benchmark for mountains by 173ft (53m) but makes up for it by its tautological name, packed history and fantastic views. The gritstone whaleback Lancashire mound lies in splendid isolation from other high ground, with the Ribble Valley to the North, the former mill towns of east Lancashire nestling in the low ground to the South, and the steep western escarpment of the hill dominating the Pendle villages which were home to the infamous witches tried for exercising their demonic powers on the locals in the early 17th century. 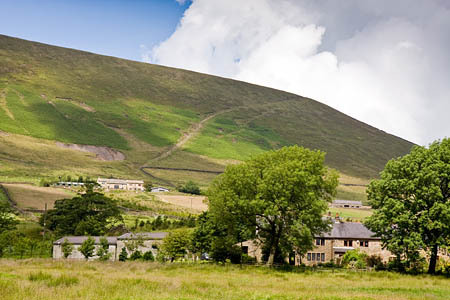 Pendle’s history stretches way beyond the witches’ period, and its broad summit was used for Bronze Age burials. 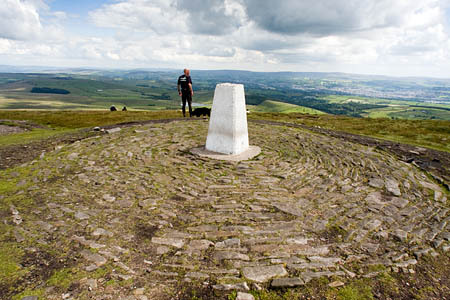 Its carboniferous millstone grit cap sits on layers of limestone, a feature in common with the Yorkshire Three Peaks, though the limestone doesn’t outcrop on Pendle. Its name means hill: three times, the first element coming from the ancient British language, with an appendage from Old English. The final ‘hill’ was added more recently as the old meanings were lost. 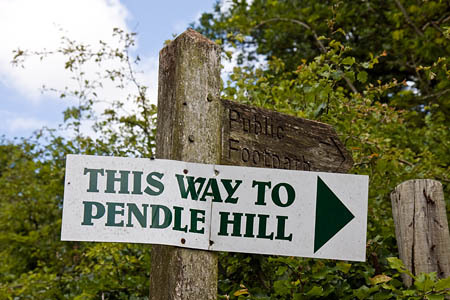 Everywhere around the huge bulk of Pendle are reminders of the Pendle witches – from bus logos to walking trails – and the influence of Demdike and her fellow accused pervades the village of Barley and many of the other Lancashire villages at the foot of the hill. However, the worst curse the modern-day walker is likely to encounter is aching calves and low cloud spoiling the view. And it’s largely the view that makes the ascent worthwhile, the summit consisting of a broad plateau of moorland topped by the ubiquitous triangulation pillar. 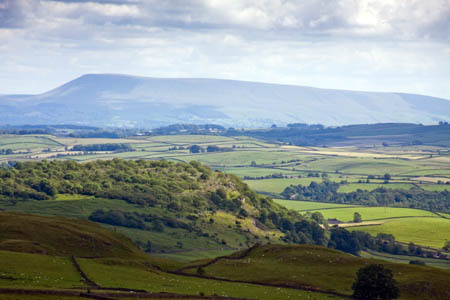 But on a clear day, the modest hill provides a vista ranging from the Lakeland fells, across Morecambe Bay to the uplands of the Forest of Bowland; the Yorkshire Three Peaks and eastern fells of the Dales; the northern Peak District hills; and there’s even a glimpse of the distant north Wales hills. It was a view that inspired the founder of the Quaker movement, George Fox, who had a ‘vision’ after climbing the steep escarpment in 1652, after presumably getting his breath back and gazing over the west Lancashire plain. The walk from the village of Barley can easily be accomplished in three hours and will give the legs and lungs a little exercise on the steep climb up the eastern slope. Parking is available in the village in the large car park at a cost of £1 for the day when we called, but be aware the gates are locked at 9pm in summer and 6pm in winter, so if you’re planning a walk in the dark, don’t use the car park. There is on-street parking nearby. Take the main street northwards through the village, past the Barley Mow restaurant, for 350m. After the village tea room, look for a finger post on the left, leading on to a path beside a small beck on the right and farm buildings on the left. There is a plethora of signs directing walkers over a footbridge then past houses until the path leads out into open farmland with the ascent path visible raking diagonally up Pendle’s flank. 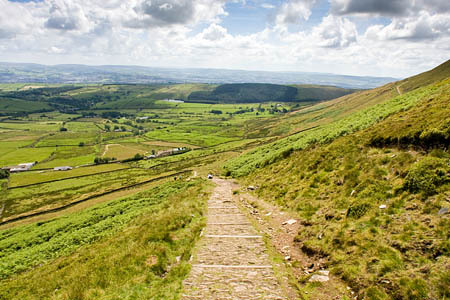 Follow the path as it rises through another field then skirts to the right around the top of Pendle House, and then diagonally left to open countryside and the start of the paved path up to the shoulder of Pendle Hill. Fill your lungs and gird your loins for the 150m (490ft) climb to reach the summit plateau. The path turns sharp left when it meets the wall, with a stone pillar indicating Downham is in the direction of the stile. Don’t cross the stile but continue south-westwards to the trig pillar which is surrounded by paving setts. Take a while to admire the view, unless the cloud is down, before heading off still south-eastwards on the path leading gradually downhill. In mist, the summit plateau can be a little confusing. Use a compass bearing if necessary. After 500m, take the right-hand fork. A grassy path leads round to the right and joins Boar Clough which it then follows to the left. Follow the clough and its small beck southwards until its steep meeting with Ogden Clough. Turn left and follow the path which leads to Upper Ogden Reservoir. Join the reservoir track which leads past a pine plantation before reaching Lower Ogden Reservoir. Follow the access road, past the old Nelson Waterworks building and through the hamlet of Barley Green before joining the main road into the village. Turn left and return to the village centre. Mapping and the route for this walk are on our grough route system. Key in Pendle Hill and grough walks into the keywords to find it. I know this hill well, born in Nelson, now living in Clitheroe. A good article with excellent pics. Pendle is my local hill I live in Nelson 10 mins drive to Barley, my favourite is an evening walk up Pendle to watch the sunset over the bowland fells followed by a pint in the Pendle Inn. Thanks for this nice plug for old Pendle, Bob! By the way there is a narrow band of limestone (?the Pendleside limestone?) which outcrops on the Ribble Valley side. And at its foot on that side are some low hills formed of limestone reef knolls, full of crinoids. We've got some nice pics of dotterel on the top. Did this walk for the first time today. I would caution the less than fully fit (like me) that the steep part of the walk is very hard work indeed. Worth it in the end, but take plenty of rests on the way up.